This shop has been compensated by Collective Bias, Inc. and its advertiser. All opinions are mine alone. 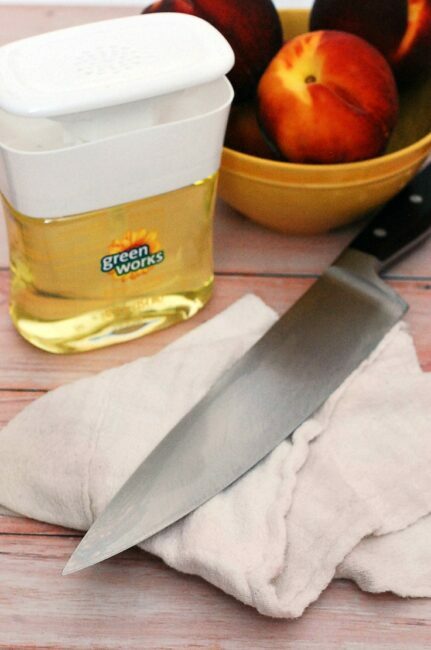 #NaturallyClean #CollectiveBias Clorox Green Works Pump ‘N Clean is food-safe, so you can easily clean your knife in between cutting ingredients for these Peach-Basil Crostini. As a food blogger, I think a lot about flavors. When I’m developing a recipe, I want to keep the flavors separate until I decide to combine them. Sometimes I’ll even work on two recipes at once, and I don’t want flavors combining at all! It was drilled into me in culinary school to avoid cross-contamination, both of germs, and of flavors prior to cooking. As you can imagine, there’s a lot of prepping of produce involved, and that means a lot of knife-washing in between. Chop, chop, chop— run to the sink, wash and dry — back to the table, chop, chop, chop. 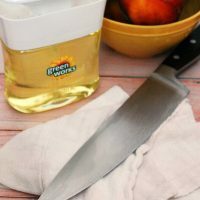 Clorox Green Works has developed a new, food-safe product that allows you to clean your knife between chopping without doing a full wash-and-dry at the sink. It’s called Pump N’ Clean, and it’s conveniently located in the natural-cleaning aisle of your local Target with Green Works’ other natural cleaning products such as dishwashing liquid, compostable cleaning wipes and all-purpose cleaner. 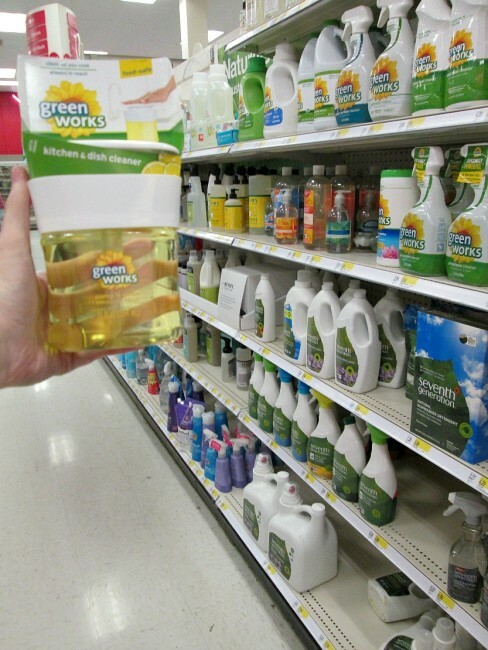 By the way, Target is the only retailer to carry the full line of Green Works products. Don’t forget to use your smartphone Target Cartwheel app — from June 14 through July 11, show the Target Cartwheel app at checkout to save 10% on all varieties of Green Works products (including Pump ‘N Clean)! Pump N’ Clean is shockingly powerful and simple to use. The dispenser is located on the top of the container. Simply place your sponge or dish towel over the dispenser, and press down. The product is pushed up, and soaks into your sponge or dish towel. 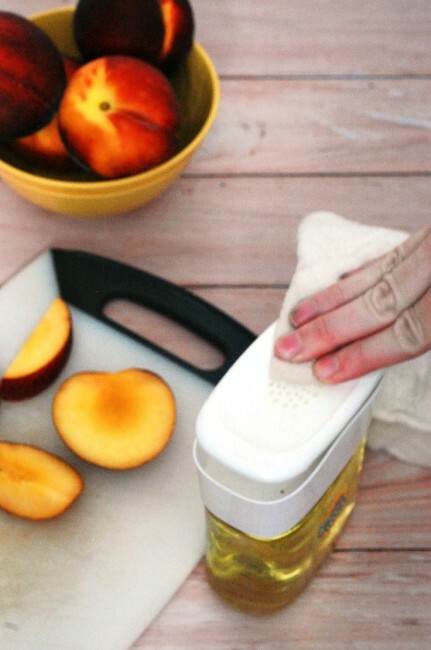 Swipe your sponge over your knife, then continue with your product preparation. I must note that Pump N’ Clean should not be used to clean up after raw meat or raw fish. Use Green Works’ dishwashing liquid for that job. It’s important to me, as a mother, to use products that don’t contain harsh chemicals on utensils that will come into contact with our food, which is why I love Green Works products. I’m also happy to use their products because they are not tested on animals, and they are earth-friendly: they’re made with plant- and mineral-based cleaning ingredients, and come from biodegradable ingredients that are naturally derived. 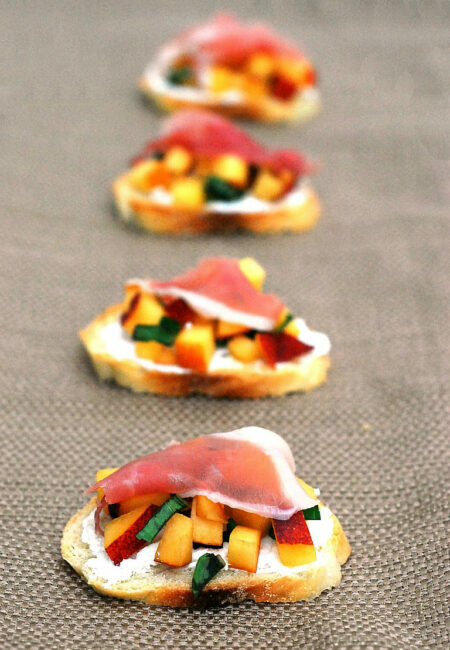 This is a quick recipe already, but I was able to put together these peach-basil crostini even faster without having to stop to wash my knife between cutting the peaches, basil, onion and prosciutto. I’ve been looking forward to enjoying fresh, local peaches ever since they dwindled away late last summer, so the faster I could get one of these into my mouth, the better! 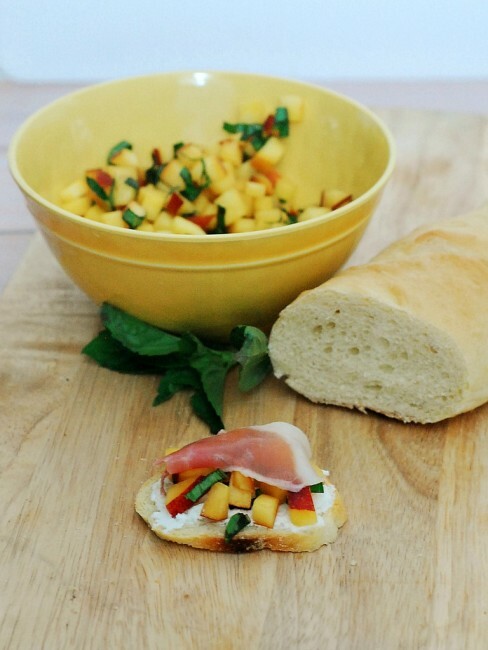 I love appetizers that combine multiple flavors, like the sweet peaches, savory basil and salty prosciutto used here. There are also contrasting textures in the crunchy baguette, the creamy cheese, and the tender peaches and onions. The best part? These are so easy to make! Aside from toasting the baguette slices, there is no cooking involved. Pump N’ Clean is also easy enough for my 3.5-year-old to use. He loves being Mommy’s Kitchen Helper, so I can hand him a rag, have him press the Pump N’ Clean, and wipe up the juices from the peaches that spilled off the cutting board while I was chopping. I need have no qualms about him remembering to wash his hands afterwards, before handing him a crostini to sample. Now that I’ve shared how I keep my kitchen clean while I cook my favorite summer dishes, I want to hear your kitchen cleaning tips and favorite summer recipes! Preheat oven to 350 degrees. Place baguette slices on a baking sheet and toast in the oven for 5 to 7 minutes. In a bowl, combine the peaches, onion and basil. Spread about a tablespoonful of ricotta cheese on each baguette slice. Top with about a tablespoonful of the peach-basil mixture, then a piece of prosciutto.